These farmyard animals wearing festive knits are just a bit of a publicity stunt - but it is publicity for a good cause, as they are promoting giving gifts to poor farmers in Africa this Yule. UK charity Send a Cow is encouraging people to move away from traditional gifts this festive period and instead purchase a gift that can make a tangible difference to the lives of some Africa’s poorest people. The charity has more than 30 virtual gifts to choose from, including goats (£33), calves (£55) and chickens (£8). This year, Send a Cow is aiming to sell 20,000 gifts, sold through its Christmas catalogue, which can be used across its projects in seven African countries. Select the animal of your choice from the website, make the donation and you will then be sent an ecard or gift pack. Your gift provides a future for families and whole communities. Head of individual fundraising at Send a Cow, Vickie Wood, said: "The UK spends over £2 billion on unwanted Christmas gifts, many of which end up in the bin or get stuffed in the loft. This year, we’re encouraging people to buy an ethical gift instead. Livestock such as goats and cows can make an incredible difference to the people we work with. They produce milk, which can be drunk by families and sold at the local market to generate an income, and they also produce manure, which can be used to nourish vegetable crops." 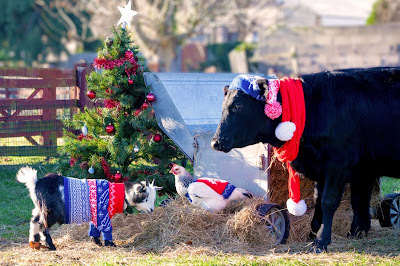 In the photo at the top, Clover the cow, Paddy the goat and Sage and Onion the chickens modelled the hand-knitted Christmas jumpers for the publicity drive to make people in the UK more aware of how they can help make a positive difference to farmers like Jessica. The animals were photographed at the St James City Farm in Gloucester, where they are looked after by volunteers Cathy and Ryan. The animals’ jumpers were hand knitted by knitwear designer Elise Hurcombe. She used more than 50 balls of wool to create the jumpers and describes this as one of her most unusual commissions. Note: Cows you buy will not be put on planes, according to the charity. I am mentioning this for those concerned about the treatment of the animals.